There are profound changes ahead for industries such as finance, making this a critical time to examine innovation at the intersection of finance and technology. 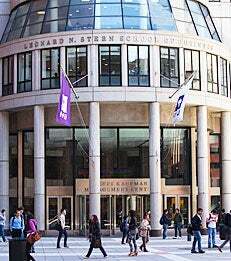 New York University’s Stern School of Business, the first business school to establish a FinTech specialization for MBA students, held its inaugural FinTech Conference on November 9, 2016. Featuring keynote speaker Dan Schulman (MBA ‘86), president and CEO of PayPal, the conference addressed many critical issues in the industry, ranging from regulation to public policy, equity crowdfunding, marketplace investing and blockchain technologies. In conjunction with the conference, the School also announced the appointment of Kathleen DeRose (TRIUM ‘11) as the new Executive-in-Residence for FinTech at Stern. A seasoned FinTech professional, Ms. DeRose also serves as the Chair of the Board of Evolute Group AG and is an active FinTech start-up investor. Her depth of experience includes holding senior positions at Credit Suisse, Scudder Stevens & Clark (Deutsche Bank) and JPMorgan Chase. The day-long forum convened thought leaders from industry, academia and government to discuss how technology is reshaping financial services. Research presentations included “The FinTech Opportunity,” by Professor Thomas Philippon and “Blockchain, DAOs & the Future of Finance,” by Professor David Yermack, followed by a response/critique to those presentations by Ken Kroner, former senior managing director at BlackRock. Dan Schulman, president and CEO of PayPal, concluded the presentations with a fireside chat with Professor Charlie Murphy (MBA ’74) and Q&A from the audience.